UPDATE, 2.40pm: The Bureau of Meteorology has issued a flood watch as a tropical low in the Coral Sea is likely to approach the coast over the Easter long weekend. "Areas of heavy rainfall may develop within the Flood Watch area from late Sunday through to Tuesday," the bureau's warning reads. "The location of the heaviest rainfall remains uncertain and is dependent on the movement of the low. Any significant rainfall may cause river level rises above the minor flood level from Monday and may also lead to local flooding." Catchments which may be affected include the Haughton River, Burdekin River downstream of Burdekin Falls Dam, Don and Proserpine Rivers, Pioneer River, Connors, Isaac and Styx Rivers and Plane Creek. Authorities are reminding people if it's flooded, forget it and don't drive through floodwaters. UPDATE 1.30PM: AS the weather bureau continues to monitor ex-Tropical Cyclone Iris' off the Central Queensland coast, Queensland Premier Annastacia Palaszczuk has issued a warning to residents. "I really want to urge Queenslanders over the next few days to please listen to the Bureau and listen to the updates that are being provided," she said. "We have ex-Tropical Cyclone Iris off into the Coral Sea and the issue with this weather system is she has potential to bring a whole lot of rain to the east coast of Queensland. The current weather system off Qld has the potential to bring a lot of rain to the eastern part of the state. Listen to the @BOM_Qld and authorities and please think about your safety. "We are already starting to see some of it but we do think the biggest impacts could be around Easter Monday when I know a lot of families will be travelling." Premier Palaszczuk said the areas in the firing zone were the Capricorn Coast and further north as the system continues to move. INITIAL: IT'S looking more and more likely that ex-Tropical Cyclone Iris is ready to bring a deluge to the coast around Mackay over the next week. Weatherwatch meteorologist Anthony Cornelius explained a few different models of where the system will track over the coming days. "Ex-TC Iris is expected to track closer to the coastline and unfortunately that could mean some more heavy rain for areas of northern Queensland," Mr Cornelius said. "(The European Centre for Medium-Range Weather Forecasts) is really holding the system with a fair bit of intensity still as it brings it closer to the central Queensland coastline -- this results in most of the rainfall around the Central Coast, Whitsundays and Capricornia regions)." Ex-Tropical Cyclone Iris is currently stalled in the Coral Sea, but officials and storm chasers are watching its movements over the next 12-24 hours to see if it re-develops into a cyclone. Either way, the Bureau of Meteorology has upgraded its eight-day rainfall forecast, showing North Queensland is in for 200-400mm of rain between now and next Wednesday. 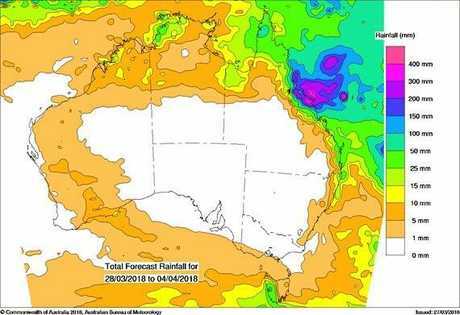 The Bureau of Meteorology has upgraded its eight-day rainfall forecast, with up to 400mm of rain expected for parts of the north. The Bureau of Meteorology said the tropical low in the Coral Sea, northwest of New Caledonia, would stall today before swinging northwest towards the Queensland coast tomorrow. "Ex-tropical cyclone Iris is located to the west of New Caledonia in the Coral Sea. This system is forecast to move northwestwards on Thursday and remain a sub-tropical low," the bureau's Wednesday afternoon outlook said. "This system is expected to develop further from Friday and is rated as a low chance (5-20%) of redeveloping into a tropical cyclone. It is expected to remain offshore of the Queensland coast for the next three days." L&K Mackay Severe Weather is predicting showers for Good Friday, Saturday and Sunday with showers increasing on Easter Monday. "Gale force winds may develop north of Bowen during Sunday and Monday as a result of a pressure gradient squeeze between ex-TC Iris and developing ridge along the coast," the forecast read. Queensland Premier Annastacia Palaszczuk, speaking in Cairns Tuesday night, said the monsoon low that officials were monitoring "could produce severe weather right down the Queensland coast." "We are better off to be prepared than to face the consequences," she said. Some forecasting weather models predict the system could re-intensify into a category two cyclone, and possibly make landfall in North Queensland by Easter Sunday. Higgins Storm Chasing's Easter forecast says the Central coast, between Mackay and Fraser Island, will see strong winds and scattered showers next week. 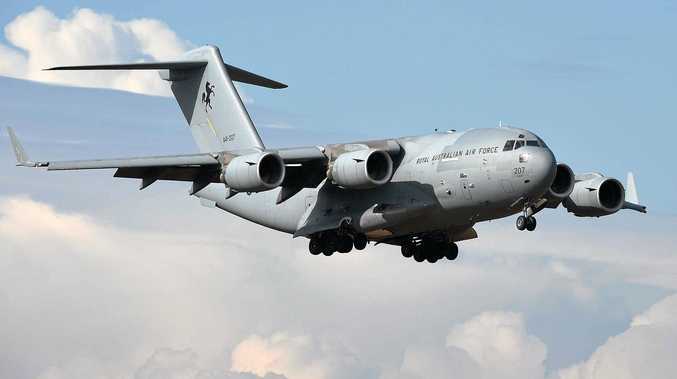 "At this stage the most likely scenario is an increase in strong south east winds and showers from Friday to Sunday with 25 to 50mm expected," Higgins said. "On Monday and Tuesday if the low stays well offshore like a majority of models predict the south east winds and showers will continue with an additional 25mm." The storm chasing team said the low pressure system was "not forecast to re-develop into a cyclone". "The low is forecast to move south west during Thursday before turning towards the north west on Friday, Saturday and Sunday," Higgins said. "It MAY near the Central to North Queensland Coast between Mackay and Cairns on Monday and Tuesday but there is a lot of uncertainty of this scenario." Higgins added if the system did cross the coast, there'd be a massive increase in rainfall of between 300 and 600mm between Tully and Mackay. "Temperatures across the eastern and northern half of the state are forecast to be between 27 to 33 degrees during the Easter outlook period," Higgins said.